Macally CHARGER61 MacBook/Pro charger with magnetic USB-C cable Macally CHARGER61 MacBook/Pro charger with magnetic USB-C cable by Prisma Computer in Cyprus [CHARGER61-UK] - €55.99 : PrismaStore!, The source of Apple products. The Macally CHARGER61 is a stylish and sturdy aluminium 61W USB-C wall charger, specially designed for your MacBook, MacBook Pro and any other computer, tablet or smartphone with USB-C ports. The USB-C port provides a Power Delivery output of 61W (5-20V/3A) to quickly charge your MacBook, iPad Pro, iPad and iPhone at Apple Fast Charge speed. It is fully certified (UL, FCC, CE, RoHS and REACH) for maximum safety and protection of your devices. The connectors of the USB-C cable are in the same stylish aluminium finish. The USB-C end consists of two magnetic parts to break away easy and protect the USB-C port in your MacBook, MacBook Pro, Chromebook Pixel, etc. from being damaged after an accidental yank of the cable. The CHARGER61 includes a 6ft/180 cm long power cord and a 4 ft/120 cm long USB-C cable, which add up to 10ft/300 cm total length, and brings any 100-240V AC socket within reach. The cables can be easily wrapped around the charger and tied together in order to avoid tangle cables and carry it around conveniently. The CHARGER61 is ideal as a replacement for your original Apple USB-C power adapter or as an affordable addition so you don’t always have to carry it around. Like this you have one charger at home and another at the office. 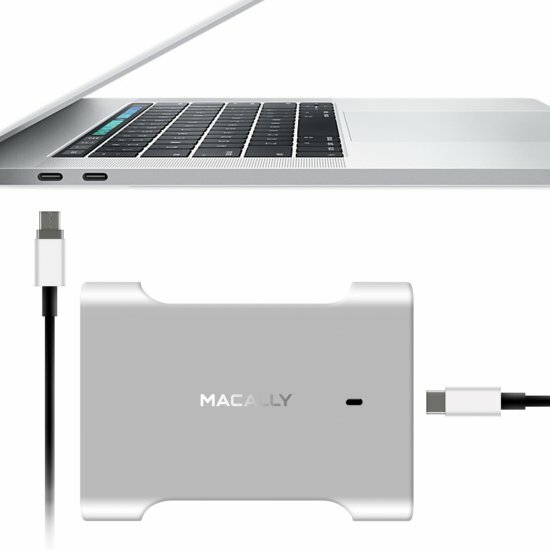 The Macally CHARGER61 is specially designed for 12-inch MacBook and 13/15-inch MacBook Pro (2016/2017), but also works with any other computer, tablet or smartphone with USB-C (5V-3A, 9V-3A, 12V-3A, 15V-3A, 18V-3A, 20V-3A).